Yesterday we went on the Buckland Bellringer’s coach trip to Cardiff. A 9.00am start saw us in Cardiff by 11.00am and we headed straight for the castle. Cardiff Castle is one of Wales’ leading heritage attractions and a site of international significance. Located within beautiful parklands at the heart of the capital, Cardiff Castle’s walls and fairytale towers conceal 2,000 years of history. After the Norman conquest, the Castle’s keep was built, re-using the site of the Roman fort. The first keep on the motte, erected by Robert Fitzhamon, Norman Lord of Gloucester, was probably built of wood. Further medieval fortifications and dwellings followed over the years. The Castle passed through the hands of many noble families until in 1766, it passed by marriage to the Bute family. The 2nd Marquess of Bute was responsible for turning Cardiff into the world’s greatest coal exporting port. The Castle and Bute fortune passed to his son John, the 3rd Marquess of Bute, who by the 1860s was reputed to be the richest man in the world. Following the death of the 4th Marquess of Bute, the family decided to give the Castle and much of its parkland to the city of Cardiff. For 25 years, the Castle was home to the National College of Music and Drama and since 1974 has become one of Wales’ most popular visitor attractions. We climbed up the steep steps to the Keep. We walked the Battlement walk, and across the lawn where Neil paused by an 8lb gun. The Castle Apartments were really splendid. First we visited the Arab room which had an amazing ceiling. Beautiful wall paintings and murals decorated the Banqueting Hall. The Library was well stocked with ancient books. Outside was an ornate and detailed clock tower. We stopped by where the Falcons were kept and used to scare off pigeons. In Cardiff town along the main shopping street where we stopped for some lunch were really colourful hanging baskets displays. Our next stop on our tour was the Brecon Mountain Railway but that is a subject for a separate blog. 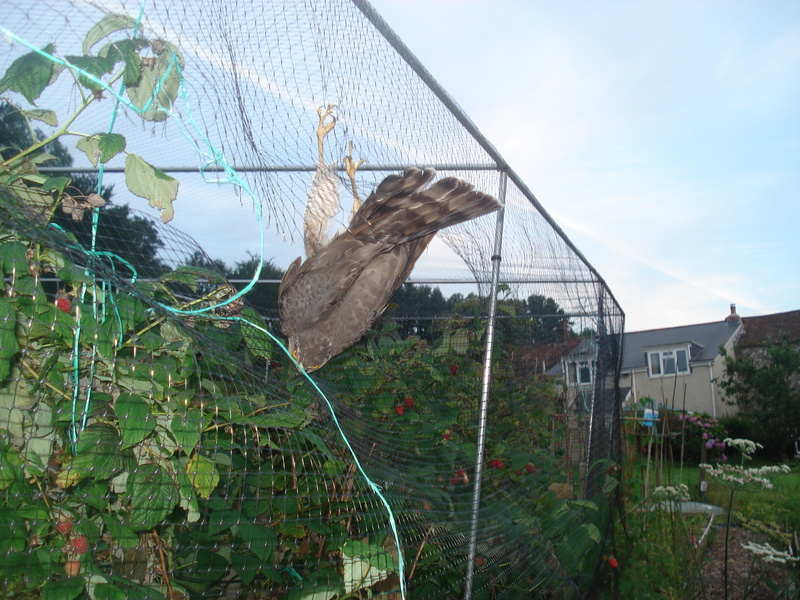 Our neighbour called us the other evening to say there was a bird caught in our fruit cage. I went down to investigate and to open the door to let it out thinking it would be a pesky blackbird as they will do anything to get to my raspberries. Instead when I got there I found it was a sparrowhawk. I recognised it by its yellow legs. 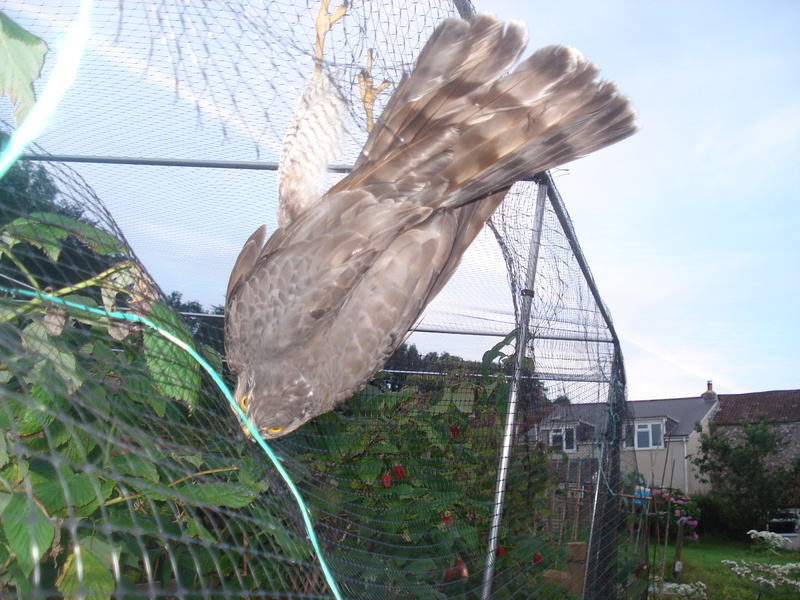 It had found a gap in the netting between the roof netting and the side netting. It was flapping about and flying back and forth, but of course did not see the open door that would have meant its freedom!!. I didn’t fancy going into the fruit cage as I wasn’t sure if the bird would attack me if I got too close. So I called Neil and he came down with a towel. His idea was to wrap the towel around the bird, prise it from the netting and then set it free. However, before we got round to doing that the bird found the same gap it had entered through and quickly freed itself and flew away. You can see where the green string that was keeping the roof netting and the side netting together has come apart, so now we have some repair work to do before the same thing happens again. Yesterday Neil was walking down to feed the chickens and he came across a baby pigeon that had had its neck torn out. He wondered what had done that, as neither of our cats are bird catchers anymore. Just a little later we spotted a beautiful bird of prey hopping around the area, and it was a sparrowhawk. It had yellow legs and lovely mottled plumage on its chest, but the wings were brown and well camouflaged amongst the leaves on the ground. 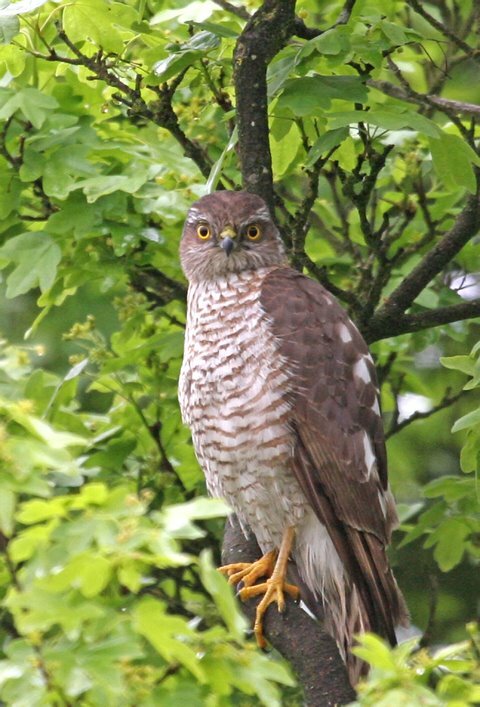 This is the first time we have seen a sparrowhawk in our back garden. We often see a buzzard which circles around on the thermals and then rests on a telegraph post, but we hadn’t seen a sparrowhawk before. Eventually it flew off and we haven’t seen it again.